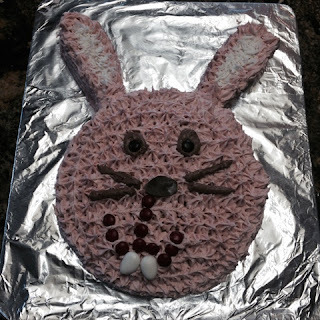 I never claimed to be a cake decorator, nevertheless I'm pretty pleased with my first attempt (with Elise's help). 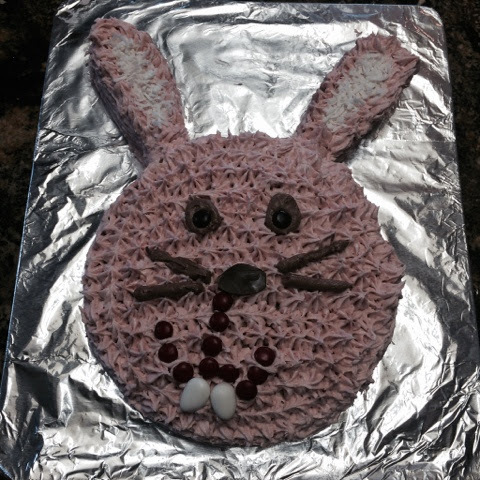 Meet SWAG, the Easter Bunny. Made with fresh strawberry icing and white cake, the carb amount is anyone's guess. But we will worry about that afterwards. For now, Happy Easter and lovely BGs to you all! 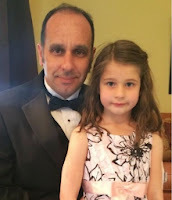 A few weekends ago, Fred took Elise to her very first Daddy/Daughter prom. She was so excited for the event; a pretty party dress, shoes with a hint of a heel (her first! ), body spray with sparkles, and some eye glitter and lip gloss. She didn't want to look in the mirror until she was all done up. The results had her uttering a hushed, "oooohhhhhhhhh!" As she twirled and curtsied in front on the full length mirror. There was a small party at a neighbour's house before all the dads and daughters left. There were appetizers, the girls admired one another, and we took pictures. Like the one above. To the casual observer, the little girl does not appear to be enjoying herself very much. She looks like she doesn't even want to be there. And that's because they are missing the ugly underneath. The ugliness of a blood sugar that was 356. And a CGM that had been reading HIGH most of the afternoon. The awfulenss that was all the other little girls drinking sparkling grape juice in fancy cups, while I only let Elise have a tiny sip, just to try. And even though I encouraged her to have a chocolate covered strawberry (high BG be damned), she didn't want to because she knew she was high and didn't want to go higher. The ugly underneath of diabetes is not only how it can damage physically, but also so heart-breakingly emotionally too. After awhile, you kind of grow hardened to the BG checks and pump changes... it's all a part of a routine, like brushing your teeth. But what you never get accustomed to is how this disease pierces your heart when it wrecks havoc on the emotions, and you're the only one who sees the tiny tears slip down your child's face as she tries to sit unnoticed in a corner. It just about breaks me. But at the end of the night, while her CGM from that evening looked like the world's most vomit-inducing roller-coaster, she still declared the night, "pretty much the best time ever in my life." Because the beautiful underneath that people also miss is just how strong and incredible these kids are. 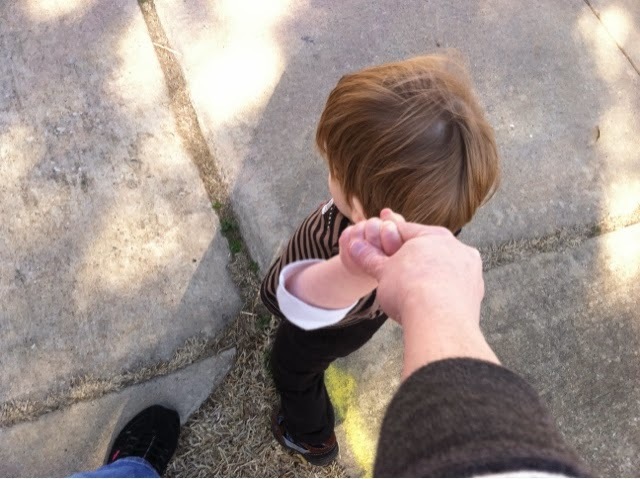 This is Lucas and I out for a walk. We take a lot of walks together in the mornings when the other two are in school. And it always brings back memories of when Elise and I would take similar strolls through the hood; just the two of us. Siblings had not yet entered the picture. One day as we had rounded a corner, we happened upon a fire truck. Elise was probably only 14 months and had only been diagnosed two months previous. I thought she would love to look at the shiny truck and see the firemen (it wasn't an emergency, a fire captain used to live in our neighbourhood). She was taking it all in when a funny look came over her face. All the blood drained out and she started to scream. That bone-chilling cry that only the Mom of a T1 baby knows. And my heart almost stopped because I realized I had left all of her stuff at home. I scooped all 18 pounds of her up and sprinted to my house.... about 20 houses away. I quickly checked her and a 52 popped up (funny how after 5 years I can still remember these details). I never forgot her bag on our walks after that (funny how I didn't even think about the firemen). These days, our walks are a whole lot lighter. Even now, I still have moments of panic when I realize I'm not carrying a meter. Even though I don't have to. No matter what, diabetes is always there. Okay... I know I said I'd announce the winners Monday. Or maybe I said I'd do the drawing on Monday. Either way, I didn't. But I did the drawing yesterday and I'm posting the winners today, so... sorta win? At least it's this week. Here's my lovely assistant, Vanna... Er, Elise helping with the drawing. She donated her hat (notice that it matches her outfit... she wanted me to point that out) to the cause. Congrats you two, you are now the proud owners of a box of Diabetic Dabs (adorable girl not included)! Please email me your address (joanne at death of a pancreas dot com), and I will send them right out to you!